Rob Levitt, who co-owns Chicago’s popular The Butcher & Larder meat shop with his wife Allie, was very generous with his time prior to his charcuterie workshop at FamilyFarmed‘s Good Food Festival Saturday — contributing a blog post about his experiences as a chef and butcher for Good Food on Every Table and also doing an interview for a subsequent story on the site. Well, it turns out that Rob is also very generous with recipes. 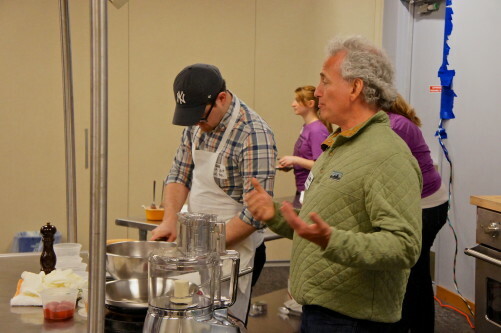 He provided the directions for two different types of pâté, a country loaf made from ground pork and another made with chicken livers, that he made during his workshop. Those recipes are published below, along with photos from the session. The Levitts will be soon be moving The Butcher & Larder operation from its current storefront in Chicago’s Noble Square neighborhood a mile or so north to Bucktown, were they will have a much larger space in the innovative retail store being built by Local Foods Chicago. To read a Good Food on Every Table story about this project, please click here. And thanks again for the recipes, Rob. 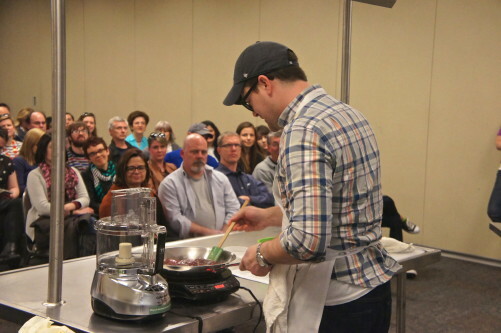 Rob Levitt of Chicago’s The Butcher & Larder conducted a charcuterie workshop at Family Farmed’s Good Food Festival Saturday. 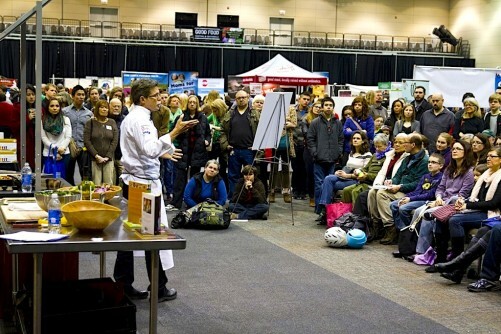 Here is doing prep work while being introduced by Family Farmed President Jim Slama. Cover the bread in cold water and soak for 5 minutes. Squeeze dry and finely chop with a knife or pulse in the food processor. Wrap a tablespoon of the mixture in plastic and cook in boiling water. Cool and taste for seasoning. Adjust as necessary. Line a terrine or loaf pan with plastic film. Pack the pâté mixture into the pan. Press thoroughly to avoid and air pockets. Wrap the pan in several layers of plastic wrap and place in a water bath. Be sure the water comes up to 2/3 of the pan. Bake for about 1-½ hours or until 155°F internal temperature. Cool to room temperature and refrigerate overnight. 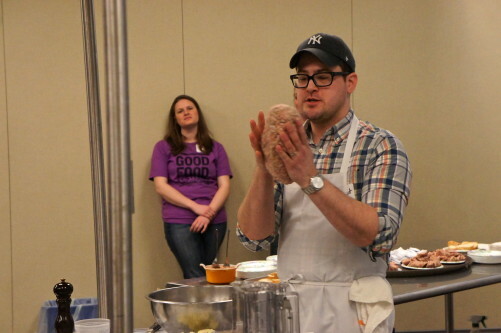 Rob Levitt of Chicago’s The Butcher & Larder mixes ground pork and other ingredients for a country pate at a charcuterie workshop at Family Farmed’s Good Food Festival Saturday. Rob Levitt of Chicago’s The Butcher & Larder shows the loaf he made for a country pate at a charcuterie workshop at Family Farmed’s Good Food Festival Saturday. Drain the chicken livers, pat dry and set aside. In a non-reactive skillet, heat just enough butter to coat the bottom of the pan. Add the livers and cook briefly on both sides. The livers should be cooked no more than ‘medium rare’ and if parts still seem a bit raw, that is okay. The residual heat from resting and puréeing will finish cooking them. Remove the livers from the pan and set aside somewhere warm. Add the garlic and rosemary leaves and cook until the garlic is softened and fragrant. Add the tomato purée and cook until it is dry and pasty, and the edges have begun to caramelize. Add the stock and cook until reduced by half. Place the cooked livers and the stock mixture in the bowl of a food processor. Add a good pinch of salt and purée. While the machine is running, add the butter piece by piece. Continue to purée until smooth. Place the liver into a sieve over a bowl and press through with a rubber spatula. This will guarantee a nice, smooth pâté. Taste, and add salt as needed. Put the pâté into a decorative serving container and press a sheet of plastic wrap directly on the surface. This will prevent oxidation. Place in the refrigerator for a couple of hours to allow the pâté to set. Bring to room temperature and serve with some grilled country bread and pickled onions. 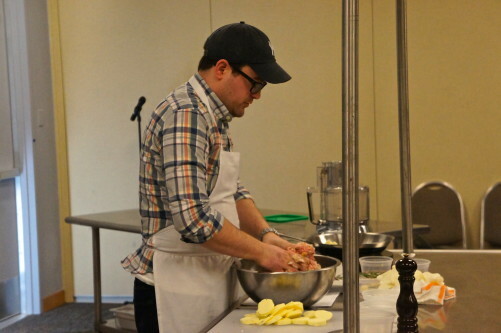 Rob Levitt of Chicago’s The Butcher & Larder prepares chicken livers for a pate during his charcuterie workshop at Family Farmed’s Good Food Festival Saturday. Place the onions in a non-reactive, sealable container just large enough to hold them. Mix together the vinegar, salt and sugar and pour over the onions. Seal the container and let stand at room temperature for 1 hour. 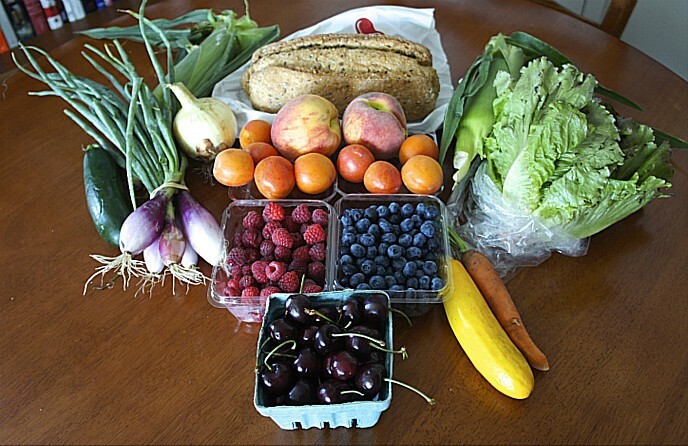 These can be kept in the refrigerator for 2 weeks. 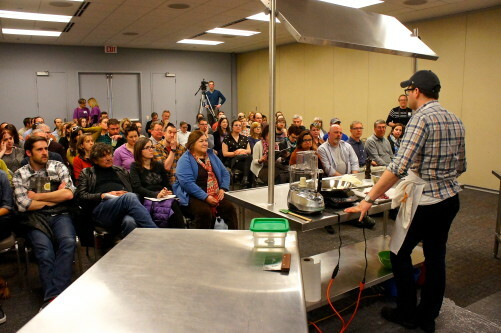 Rob Levitt of Chicago’s The Butcher & Larder filled a room for a charcuterie workshop at Family Farmed’s Good Food Festival Saturday. This entry was posted in Butchering, Food Artisans, Food Entrepreneurs, Good Food business development, Good Food Festivals, Good Food marketing, Good Food Success Stories, Good Meat, Meat, Sustainable food cooking, Sustainable food retailing and tagged butcher shops, butchers, FamilyFarmed, food artisans, Food Entrepreneurs, Good Food Festival, Good Food Festival & Conference, Good Food movement, Good Food Success Stories, meat, Rob Levitt, The Butcher & Larder. Bookmark the permalink.